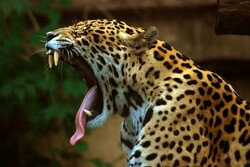 The jaguar is the only living big cat of the American continent. The jaguar is sometimes confused with the leopard because both have spots in rosettes but those of the jaguar have a black spot at the center. The yellowish buff ground color is similar in both, but in the jaguar the rosettes tend to be concentrated along the back. The belly and chest are pale and have irregularly placed black spots, and the lower half of the tail is ringed. There is a black mark near the mouth on the lower jaw, and the backs of the ears are black. The variations in color range from an almost white ground color to black forms, in which the rosettes can only be seen as a variation in texture. Jaguars vary in size from 3.9 to 6.4 feet overall. At the shoulder, they are up to 2 and a half feet high. The weight is 125 to 250 pounds, which makes it a heavier animal than the leopard or the puma. It is a good climber. It is known by a variety of names, including that of Tigre americanos. The jaguar inhabits an area that is bounded to the north by the southwestern states of the USA, and to the south by Argentina. It lives in thick cover, in forests or swamps, but it is also found in desert and savannah areas in the north and south of its range. The species is divided into a number of geographical races, which are distinguished one from the other by size and the intensity of the coloring. Each individual has its own territory and this usually consists of an area of 2 to 5 square miles although there have been records in the past of individuals that have traveled 500 miles on their own, and more, for no apparent reason. The jaguar is able to breed at about two years old. The individuals are solitary, only coming together at the mating time, which is probably in January in the northern part of the range, but at no fixed time elsewhere. After mating, the female has no more to do with the male and, after a gestation period of 95-105 days, the cubs are born. The usual size of a litter is two but there have been as many as four. The young are fully furred at birth and blind. They first emerge from the den at two weeks of age. From the time that the young animals leave the den, their growth and development follows a similar pattern to that of the young of other big cats. 40571 Features: -Jaguar.-Cuddle up with this adorable TY beanie baby.-A sure favorite and great for that collector in your life. The jaguar is one of the roaring cats, but it appears to make very little use of this ability, and in this it is similar to the leopard. The most common sound is a grunt, usually made when it is hunting. In addition to this, the male makes a mewing noise in the mating season, and a cornered animal will snarl and growl at its enemy. Like many of the other cats, the jaguar is an accomplished swimmer and has no fear of water, although it does most of its hunting on the ground or in the trees. It mainly feeds on peccaries, but the range of food taken is very wide and it will hunt deer, capybara, tapir, agouti, sloth, monkey, and a wide variety of birds. It also eats fish, which it catches by scooping them from the water, turtles and small alligators and crocodiles. Like so many of the cats it cannot resist the chance of an easy meal and will raid domestic stock whenever the opportunity arises. The jaguar demonstrates remarkable strength, and has been recorded as pulling a dead horse through 70 yards of brush and then towing it across a river. It does not appear to have the same reputation for man-eating as many of the African and Asian cats, but this could well be because the area in which the animal lives has not yet been exploited to the same degree as have the habitats of the other cats. Jaguars will also eat carrion and they are often lured into traps by this means. The method of killing prey is very similar to that used by the leopard, but the jaguar, if the first attempt does not succeed, will often leave the intended victim and go to seek food elsewhere. Once a kill has been made and has been dragged to a place of the animal's liking, it will usually be buried, but should the ground be too hard or rocky, no further attempt will be made to conceal the carcass. The jaguar seems unaffected by the smell of high meat and it will return several times to a kill, should it be large enough. In common with all the big cats, the jaguar is often found in zoos, but it is generally considered to be more unreliable than its relatives and is treated with the greatest respect. Although the animal can seldom be handled after the eyes have opened, it breeds well in captivity. Jaguars have fared better than their counterparts in the Old World and for the most part their range and numbers have not been seriously reduced since the first Europeans landed in America.